This is my third posting today! Yikes! A new record. 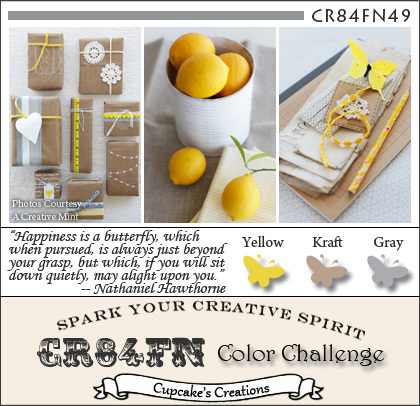 This week Mona has chosen yellow, kraft and gray for CR84FN color challenge. Beautiful colors but....not in my 'comfort zone'. Since this is a 'CHALLENGE', I challenged myself to create a card with these colors. The image is a Flourishes stamp. (I won this stamp set and two others at the Pinter-Inspiration challenge, I'll show you the stamps later in this posting). The dp are from K and Co and the image was colored with Copic markers. A Spellbinders edgeabilities die was used for part of this border. After the paper was die cut with the SB die, I used scissors to cut the individual oval pieces apart, wove ribbon through the openings and then mounted them on top of a MFT die. This is the wonderful inspirational photo that was used for this card. Last but not least here is a photo of the wonderful stamp sets that I won. THANKS FLOURISHES! Love the stamps you won! Beautiful job on the card! 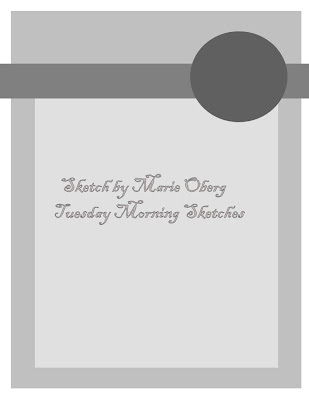 Your sketch is gorgeous and so is your card. Wow such beautiful work. Awesome sets from Flourishes!! Your card is lovely and peaceful Marie. 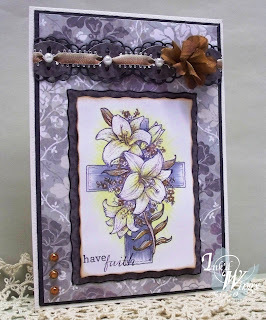 The ribbon treatment with the spellbinders edger die is just beautiful! Pretty assortment of winnings too!! So happy to hear about those daffodils!! My nieghbor has crocus in bloom...that says spring to me!!! Thanks for your lovely comments, Marie. You made my day! I've just wandered through your blog, and I have to say, your colouring is amazing. I WISH I could colour like you do. :-) This card is just beautiful. This is just beautiful Marie, your colouring is fantastic! And I love that fancy ribbon die cut border treatment too! Stunning card! Beautiful! The Easter card is gorgeous. Love that border. That's another one to add to my want list. Congratulations on your Flourishes win. Woot! New stamps are an awesome thing to win - and these are simply divine. I adore the card you created - what a wonderful way to support a friend! What a beautiful card , you have some fabulous work on your blog I am your newest follower. 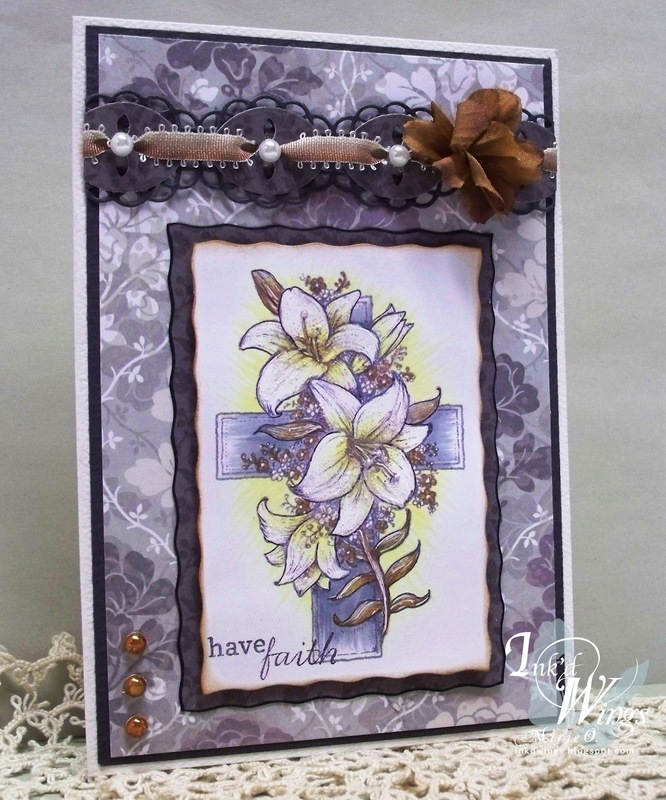 I wanted to thank you for becoming a follower of my blog...then I discovered your gorgeous card...love the ribbon testament and the beautifully colored cross! I am now a follower of yours! Wow - Marie, this is fabulous! 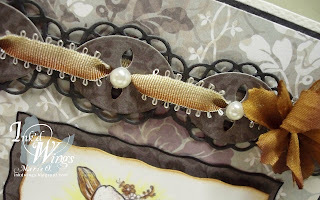 Love the image and the way you've threaded the ribbon is so pretty! Thanks for playing along with CR84FN! Congrats on winning a fun prize. This is stunning! Such a unique color combination, that really works beautifully. Fun way the ribbon is threaded through the die cut, too.